Kazuma Satou, a high school student, gamer and shut-in, died on an average day walking home from a video-game store, performing the one heroic act of his life. He reawakens in the afterlife, greeted by a beautiful but rude girl named Aqua, who claims to be a goddess that guides the youth whose lives got cut short. Aqua then offers him a choice: to go to heaven, or to get sent to a another world to defeat the Demon King. 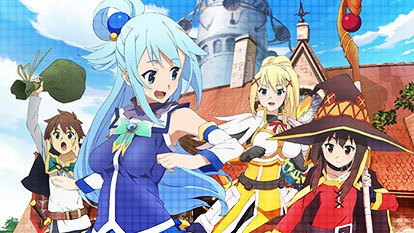 Of course, Kazuma's gamer instincts kick in, and he chooses to start a new life in a real-life RPG. There's one last choice Kazuma has to make: he is allowed the choice of one thing to take with him to the new world. After puzzling over it, he chooses...Aqua? Join Kazuma on his adventures as he tries to transfer his virtual gaming knowledge to real-life adventurer experience!